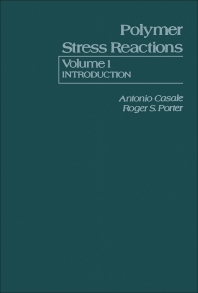 Polymer Stress Reactions, Volume 1: Introduction focuses on the interrelationship between polymer mechanochemistry and the stress-induced polymer reactions. This book discusses each nominal polymer state and describes the parameters and variables that are germane to the mechanically induced reactions in that state. The polymer degradation variables that are generally applicable to mechanochemistry, such as temperature and shear intensity, are also considered. This book consists of five chapters and begins with an overview of mechanochemistry and stress-induced polymer reactions, with particular reference to the distinction between mechanochemical reactions and other modes of reaction. The general regions of viscoelastic behavior for amorphous polymers where mechanochemistry may be conducted are also described. The next chapter explores the mechanisms underlying the modes of reaction in mechanochemistry, focusing on the effects of shear and applied stress as well as how bonds rupture. The discussion then turns to the influence of the principal variables in polymer mechanochemistry; characterization methods for evaluating the fundamentals of mechanochemistry; and methods for the synthesis of block and graft copolymers. This book is a valuable material for those interested in mechanochemistry in general and in polymer stress reactions in particular.